Be the first to share your favorite memory, photo or story of Jakub. This memorial page is dedicated for family, friends and future generations to celebrate the life of their loved one. 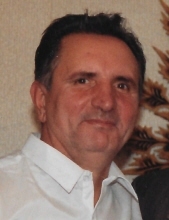 JAKUB MILON, 76, beloved husband of the late Maria Milon (nee Heldak); loving father of Grazyna (Daniel) Kaliniec, Jozef (Dorota) Milon and Vivian (George) Milon; dear grandfather of Michelle, David, Alexis, Ashley and Amanda; devoted son of the late Maria (nee Hyzna) and late Andrzej Milon; loving brother of Elzbieta Milon, Jozef (Wieslawa) and the late Sebastian and late Andrzej Milon; dear uncle of Marlena and Magdalena with their families, as well as extended family here and in Poland. To send flowers or a remembrance gift to the family of Jakub Milon, please visit our Tribute Store. "Email Address" would like to share the life celebration of Jakub Milon. Click on the "link" to go to share a favorite memory or leave a condolence message for the family.